I have always been fascinated with good foods, but it was late in my twenties and in the more recent years that my pallet began to wander off the beaten track. I began searching for more classical dishes that came together with time and work. I enjoyed the process of making a dish that developed over many steps and developing flavors. Real and wholesome ingredients began to be purchased and I was researching and learning what each ingredient meant to the dish. What the flavor of that ingredient brought to that dish and why. This was a light bulb moment for me and I was hungry for more, hence, to say the least. My husband, understanding my challenge took it upon himself to purchase something that would change my life. Something that I could not put down. A personal teaching source that was so thorough and fascinating and was much needed to keep my cooking mind challenged and colorful. I opened Mastering the Art of French Cooking and began to be enthralled with knowledge and techniques. Perfecting stiffed egg whites to a “shiny sheen” was described perfectly leading me to create a masterpiece of my first Cheese Soufflé. I was a cooking machine and went on to Boeuf Bourguignon, Coq Au Vin and Salad Nicoise. All perfect flavors of labor and love. I want to thank you Mrs. Julia Child, for teaching me to master the art of French cooking. It is because of you and your passion for teaching perfected details that I am able to offer you shiny stiff peaks. Join Samantha and the #SundaySupper group in kicking off #CookForJulia Sunday night. For more information, click here. My name is Samantha Ferraro, and I am very excited to share the immense passion I have for cooking and sharing it with the world. I am a Brooklyn native, Hawaii lover (having lived there for 10years), and current So Cal resident. Cooking has always big a huge activity and stress reliever for me, and it’s not far off to see me start chopping onions like a mad women in midst of text books during finals week! I live in a small beach town in Southern California, minutes away from the weekly farmers market and a block away from the ocean, with my wonderful husband, who is the wine extraordinaire of the family, and our adorable almost Human-like Lhasa-Apso, Hula. 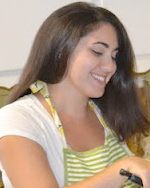 You can find Samantah at her website Little Ferraro Kitchen, as well as on Facebook and Twitter.